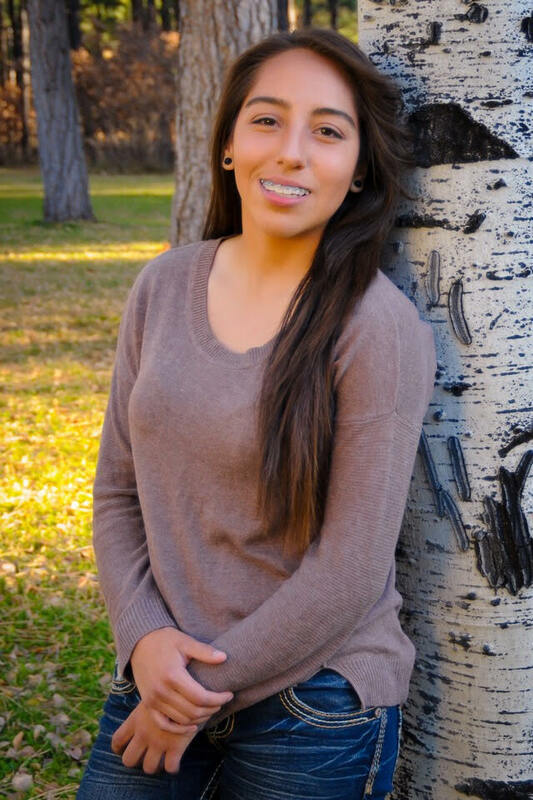 Kimberly Armendariz is the 2018 recipient of the Patty Aragon Green Chile Classic $500 scholarship. PAGCC’s mission is to build community in the Pagosa Springs and the southwest while celebrating our cultural heritage through local cuisine and music. “Everyone has a different way to live their life, but our traditions and our ancestors helped shape us into who we are, they helped to create us; their teachings, the life lessons I’ve learned brought me where I want to be. Now it’s up to me to help shape my little cousin’s, and my brother’s,” wrote Kimberly in her essay reminding us that our heritage is a huge part of our future. Being raised in a Mexican-hispanic home, our culture means a lot to us. Most hispanic people are Catholic. As I was young I didn’t really see the importance of being very religious, and celebrating “Dia De Los Reyes,” “ La Rosca” and other celebrations. I only thought about Christmas. As I continued to get older, my parents wanted me to get closer to our religion and God. I kept putting it aside until I realized that I did need God. I was struggling with myself, with my school work, and I had a lot of issues with the group I socialized with. There came a time where I was sitting in the living room with my grandparents. My parents had mentioned to them that I wasn’t considering what they were telling me about our religion and our tradition. After socializing with them, I came to a conclusion of how understanding they were. Of how my parents were raised, and how important God is to us. They explained how all the extra celebrations we do draw us closer to our family and friends. That our religious practices, like praying, donations, and just simply giving to others were some of the biggest values. It’s important to know you’re background, and how your grandparents, and your parents were raised because most of us do want to follow our parents footsteps. Being hardworking, being kind and respectful matter. Cultural heritage is very important. It boosts our confidence, it teaches us how we can achieve our goals. Our roots is what brought us here, if it weren’t for my parents I wouldn’t be who I am today. It’s beautiful to love what you’re made of, to try to get your cousins or family to get into the spirit. I sometimes notice my cousins or siblings doing something wrong, and I mention to them “La llorona” which is a Mexican well known folklore. That was something that would help me settle down. Over time I began to have similar views to my parent’s, and their teachings. Everyone has a different way to live their life, but our traditions and our ancestors helped shape us into who we are, they helped to created us. Now it’s up to me to help shape my little cousins, and my brother. Their teachings, the life lessons I’ve learned that have brought me where I want to be. Going to church, and believing in God was first. Doing the right things, and giving without expecting anything in return was what I’ve lived by and I’m very grateful of what my culture heritage is teaching me. My parents and grandparents weren’t able to get an education, and finish high school as that’s what they most desired, but now it’s my turn. I have opportunities they didn’t have. They’ve worked hard, and are doing their best to get me to college. I’ve seen their hard work, and now I’m working just as hard if not harder to make them proud and to make something out of my life. I like that I can show my little brother, cousins, and close family friends that we all have a shot in getting an education if we work hard enough for it. Every hispanic parent that wasn’t able to get an education prays that their children do, education is very important in Mexico. Mexico is a very poor country, where you can’t make much out of your life unless your parents are very wealthy. My grandparent’s weren’t wealthy and couldn’t provide a lot for my parents so they worked. As I continue to grow, and become more mature of my surroundings I realize that my culture consists of discipline, and dedication. My parent’s came here as “Dreamers” to make my and my brother’s dreams come true. I’ll be first generation to graduate high school, and start college. This is a life lesson I’ve carried with me, and will share with anybody who is a “dreamer.” Thank you for the opportunity of applying to this scholarship. It’s a blessing. It helps all sorts of cultures achieve their purpose. My hispanic culture purpose is to bring the best I could bring to those around me with love, and dedication. I will carry my heritage on into the future by showing those around me that there are opportunities, you just have to work for them; that education is important; that through God, all things are possible; and family is always important. I will lead by example.